Millennial is not Multifamily: What the traditional apartment industry can learn from Student Housing about attracting and serving young professionals. Over the past decade, student housing has changed drastically. Today’s graduated millennial has no memories of stark cinder block dorms. No, they experienced resort style convenience and amenities. Student housing has evolved and so have the expectations of that Millennial generation (now ages 22 – 37). It is no secret that today’s student housing trademarks are by-the-bed leasing, over-the-top amenities, and bed-bath parity; however, student housing goes far beyond the amenity offerings as many operators strive to build an environment that encourages academic success and promotes student interaction through resident events. This less tangible component of the experience is now an expectation of Millennial renters. Students grow accustomed to this type of environment since they typically reside in a student housing community for most of their college tenure. Therefore, as these students mature and graduate, it is natural they are seeking the same sense of community at their next apartment complex. However, many conventional communities do not emphasize the resident experience through monthly programming and events. These young professionals move from student housing, a close-knit community in which they have built lasting relationships and achieved academic goals, into communities that do not sell the same experience, which leaves them frequently seeking new living accommodations to fulfill the void. Fill the Void. Make Connections. As conventional property owners, there is an opportunity to merge this gap and cater to these new young professionals and their same desire for a sense of community and belonging. In student housing, students are sold on the residence life programming and these same students are later seeking a similar experience as they begin their apartment hunt in the conventional market. By creating opportunities for residents to build relationships and become part of a community, it will not only fill this void, but will help set the property apart from other properties in the multi-family market. While the programming efforts will look quite different than the typical student housing events consisting of pool parties, tailgating events, or grocery bingo, there are plenty of opportunities to target young professionals and to create an environment that caters to their evolving lifestyles. While the focus and way of life of a young professional has shifted from the college mindset, they are still seeking events that will introduce them to new individuals, grow in their profession, and be a part of a larger community. Focus should be placed on creating programming that caters to life experiences, career growth, and success. Events such as social mixers, networking nights, meal preparation, community fitness classes, pet meet-and-greets, or free resume headshots are examples of programming that caters to a more mature audience. The programming should also focus on selling the lifestyle and amenities that the property offers. Young professionals tend to have a new appreciation for luxury amenities and the events should fully showcase and encourage the usage of the community’s apartment and common area amenities. Campus Advantage has successfully managed many conventional communities and implemented strategic programming to target young professionals. 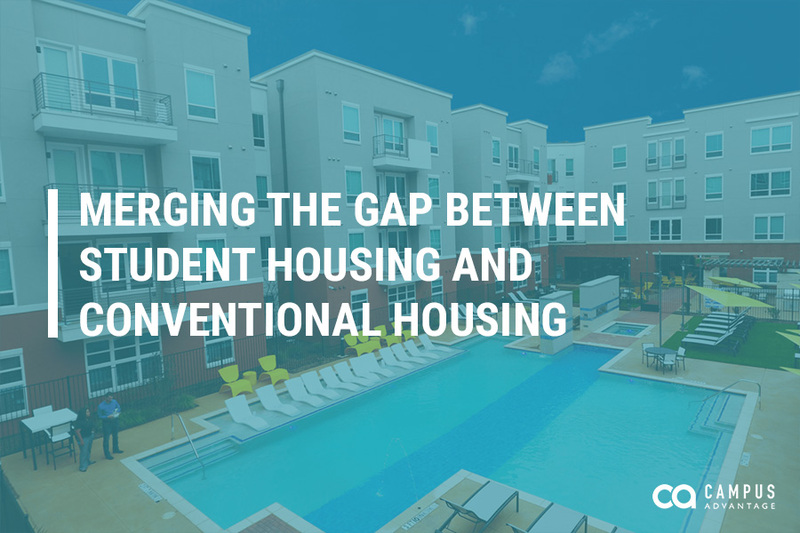 By providing a heightened resident experience, it bridges the gap between student housing and conventional housing and can result in a higher resident retention rate and increased leasing velocity. As such, word-of-mouth marketing is still an invaluable marketing technique, even among young professionals. By creating a sense of community and promoting interactions and career success, residents are more likely to share their experience and recommend the property to friends and colleagues – driving additional traffic and new leases. Properties within the multi-family market have the opportunity to capitalize on not only targeting this demographic but creating an environment in which young professionals are seeking, resulting in higher resident satisfaction and thus, property success.